Mutations in the kinase domain encoding region of EGFR gene causes drug resistance to EGFR kinase inhibitors such as erlotinib and gefitinib. This problem can be addressed by a new lead compound effective against all mutants of EGFR. To predict positions of residues possessing the potential to render EGFR drug resistant upon mutation, residual positions known to interact with Erlotinib and Gefitinib were assessed using five parameters (conservation index, binding site RMSD, protein structure stability and change in ATP and drug binding affinity). Structural screening protocol was followed to identify novel lead compound. Four positions, Lys 745, Cys 797, Asp 800 and Thr 854, were most likely observed to acquire drug resistance by altering drug binding affinity without destabilizing the protein and ATP binding ability. A compound DHO was observed to possess better binding affinity for all EGFR models in comparison to Erlotinib and Gefitinib, using docking protocol. This information would pave the way for designing drugs effective against wild-type (WT) EGFR as well as against variant EGFRs models. Thus, authors report a lead compound as a long-term potential with the ability to inhibit predicted models of mutant, wild and known SNPs EGFR. Keywords: EGFR, Drug resistance, Kinase, Erlotinib, Gefitinib, NSCLC. Keywords:EGFR, Drug resistance, Kinase, Erlotinib, Gefitinib, NSCLC. Abstract:Mutations in the kinase domain encoding region of EGFR gene causes drug resistance to EGFR kinase inhibitors such as erlotinib and gefitinib. This problem can be addressed by a new lead compound effective against all mutants of EGFR. To predict positions of residues possessing the potential to render EGFR drug resistant upon mutation, residual positions known to interact with Erlotinib and Gefitinib were assessed using five parameters (conservation index, binding site RMSD, protein structure stability and change in ATP and drug binding affinity). Structural screening protocol was followed to identify novel lead compound. Four positions, Lys 745, Cys 797, Asp 800 and Thr 854, were most likely observed to acquire drug resistance by altering drug binding affinity without destabilizing the protein and ATP binding ability. 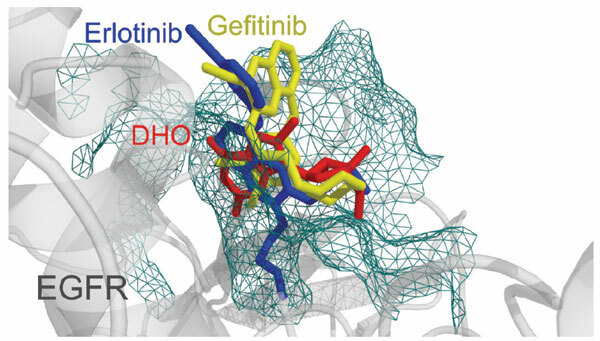 A compound DHO was observed to possess better binding affinity for all EGFR models in comparison to Erlotinib and Gefitinib, using docking protocol. This information would pave the way for designing drugs effective against wild-type (WT) EGFR as well as against variant EGFRs models. Thus, authors report a lead compound as a long-term potential with the ability to inhibit predicted models of mutant, wild and known SNPs EGFR.